I thrive when a couple reminds me how honored I am to do this work. 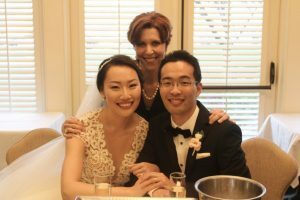 Immediately after Michael and Martina were wed on May 5th at Newcastle Golf Club, I immediately found them in an adjoining ballroom, waiting to sign their marriage license documents. Sitting side by side, and looking so happy and content, I knew without a doubt that these two were meant to walk into their marriage adventure together, day after day…loving each other. In the presence of their family and friends, and with lots of smiles and bows to their parents who didn’t speak much English, we had a sweet and personal ceremony. After a crazy weather event the day before, the crisp sunshine was an added bonus. I left Michael and Martina with great happiness…lucky, lucky me!